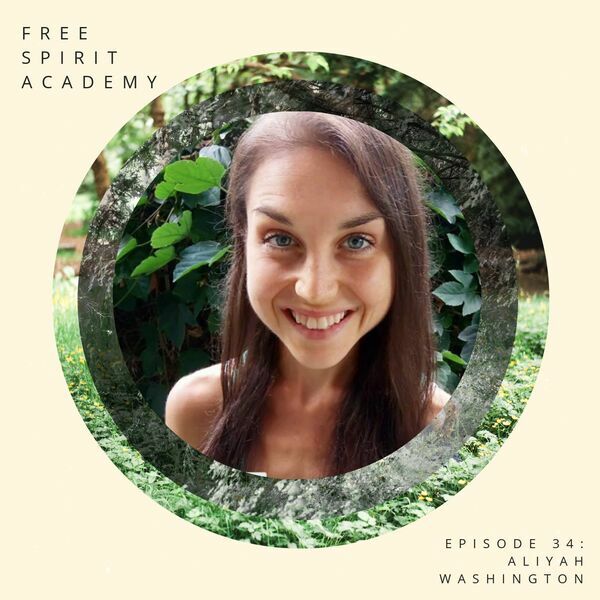 Free Spirit Academy Podcast - 34 | Aliyah Washington | Your Body Is On Your Side. 34 | Aliyah Washington | Your Body Is On Your Side. YOUR BODY IS ON YOUR SIDE WITH ALIYAH WASHINGTON. If you've been listening since early on this year, you'll have heard Aliyah on episode 2, sharing her journey through anorexia and today we go much, much deeper. I actually split this episode into two parts as it got long but I didn't want to cut any of it. As I've merged topics like eating disorder recovery with potentially extreme lifestyles and practices like colon cleansing and juicing, I've worried that folks could take things to an extreme and I've tried to be very careful about how I've approached these subjects. One of the biggest things we talked about in this conversation was how disordered eating often begins in a simple desire to just FEEL BETTER when we're in so much pain and discomfort. And because we're in so much pain and discomfort, many of us tend to reach for the most extreme version of the most extreme thing whether it's long fasts or technically perfect diets but without context or transition or embodiment. And I see this happening in the world of exploring spirituality where there are so many trying to "crush our egos" or "overcome our shadows" or we're jumping into long meditation retreats or taking ayahuasca over and over again - and again, I think that some of this stuff is a natural reaction to wanting to be out of the pain that we're in. But truly, it's gentle steps - and becoming curious about and understanding of our ego or our shadow or our painful habits - that will really begin to shift our experience sustainably and allow us to grow rather than chasing our tails and constantly starting over. When I approached the idea of this interview I wanted to call it something like "how to be spiritual or how to cleanse without being crazy" - and I ultimately decided that as catchy as it was it was a little harsh - and I ended up calling it "your body is on your side" because Aliyah and I created a program with that same name. We created it with the idea that freedom is so much more than just being free to eat whatever you want or being a certain size or being comfortable at whatever that size is. We introduce the idea that your body is actually your best guide in navigating this human life and that there is so much beyond the surface of food and weight pain. This is a course you can take anytime at your own pace and I'll leave the link below as well as links to Aliyah's other offerings! ...Holistically addressing mental, phyical, and spiritual health IN THE LONG RUN. ...Aliyah's history with anorexia that began with being a very sick child and wanting to feel better. ...How you think you should feel on any particular diet or healing regimen vs. what you're seeing in reality. ...How we can begin making everything in our world right including our emotions, our symptoms, and any way our body reacts. ...What's going on when we feel we're eating perfectly and not getting better or losing weight. And so much more, I hope you enjoy part 1 of this conversation with Aliyah Washington. Your Body is On Your Side Course. Free Spirit Academy Facebook group. All content © 2019 Free Spirit Academy Podcast.